When I attend shows or rallies I always respond that I am here to help you navigate the battery/inverter world to optimize your RV experience. Within the RV industry, there are four basic choices of batteries, the twelve-volt, which come in three sizes, a 24, 27 and 29/31 series, and the six-volt. The difference in these batteries is the size and capacity. The 24 series is the smallest and usually comes with a newly purchased trailer. The 24 series on average between manufacturers is an 85ah battery with 140min reserve. An ah is the amp hour rate of your battery, to put it simply, the size of your gas tank. When dealing with deep cycle batteries we prefer to use the reserve minutes. Once we know your power demands we can figure out what size of battery you need. Reserve minutes on a battery are determined by putting a 25ah load on a battery to see how long it will last. You may be thinking what in my unit draws 25ah? Well… nothing! Even if you turned everything on you would not draw that amount, it is for testing purposes only to determine battery sizes. You will notice that the 29/31 specification has two numbers, this is because depending on the battery manufacturer, it could be 29 series or a 31 series. They use both numbers for the same basic battery. 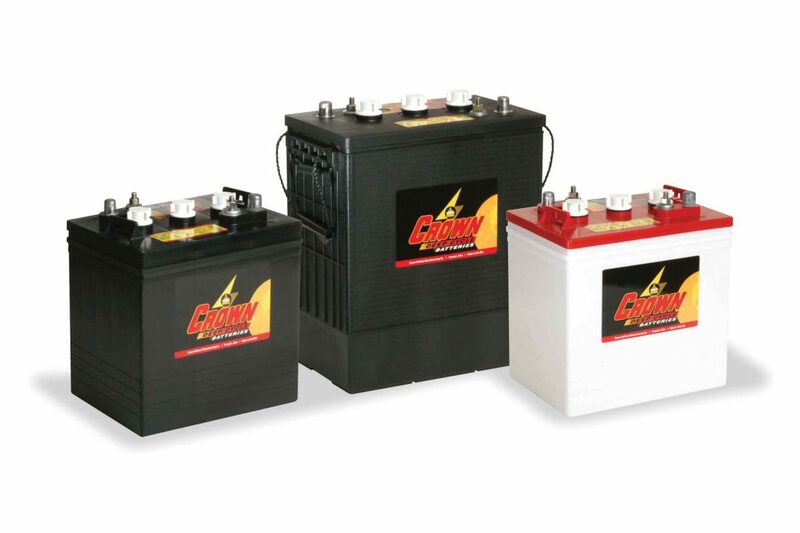 There are several manufacturers in the twelve-volt deep cycle battery industry that produce batteries of excellent quality. These include, but are not limited to, Johnson Controls, Trojan, US Battery, and Crown Battery. Beware of the big box stores. When they buy batteries from a manufacturer they usually request a lesser quality – this is a way to keep their prices down. Six-volt batteries were originally made for the golf cart industry. They are made with high standards to withstand deep discharges and they come with high reserve minutes. Again, be aware that the big box stores carry these as well, but again I’ve come to expect lower quality and lower reserve minutes with these. Another thing to keep in mind is that the battery may come with a six-month or 1-year replacement warranty. Excellent quality battery manufacturers usually offer 2-year free replacement on their six-volt batteries. Two six-volt Johnson Controls batteries would be 232ah with 447 reserve minutes compared to two twelve-volt 24 series Johnson Controls batteries that would be 170ah with 280 reserve minutes. As you can see, there is a large difference in reserve minutes. This is what makes six-volt batteries the better choice. There are some excellent manufactures of six-volt batteries, such as Trojan, US Battery, Johnson Control and Crown Battery. There is a lot more to know about your RV batteries – this is just the beginning! An inverter is what RVs use to change twelve-volt battery power into 110 volts, so you can run things like your microwave without being plugged into the campsite’s power grid. 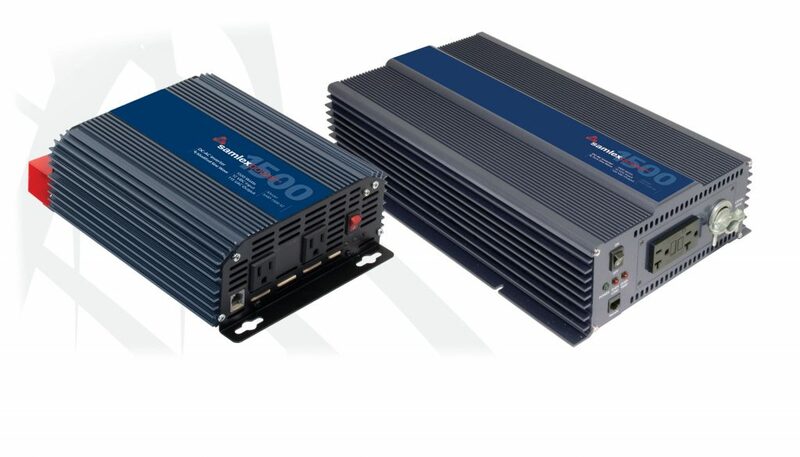 There are two types of inverters and many different sizes. I recommend we have a conversation to determine the right size for your needs. Pure Sine inverters are the cleanest power you can get, they are used to run electronics like TV’s, computers, game systems and medical equipment (like CPAP machines). Modified inverters are a less expensive option to run short-term items like microwaves, blow dryers, coffee pots and so on. Remember these are not meant to run electronics, they may cause damage and/or inference. If you have a 2300-watt modified inverter you could run most things in your RV. Air conditioners are an item that cannot be run by an inverter because they draw too much power out of your battery bank and you would not be able to carry enough batteries to last any reasonable time limit. For example, two six-volt batteries would run your AC for 20-30 minutes. If you are interested in getting an inverter for your RV, please contact us so we can help you size your inverter and make sure you make an informed purchase for your needs. 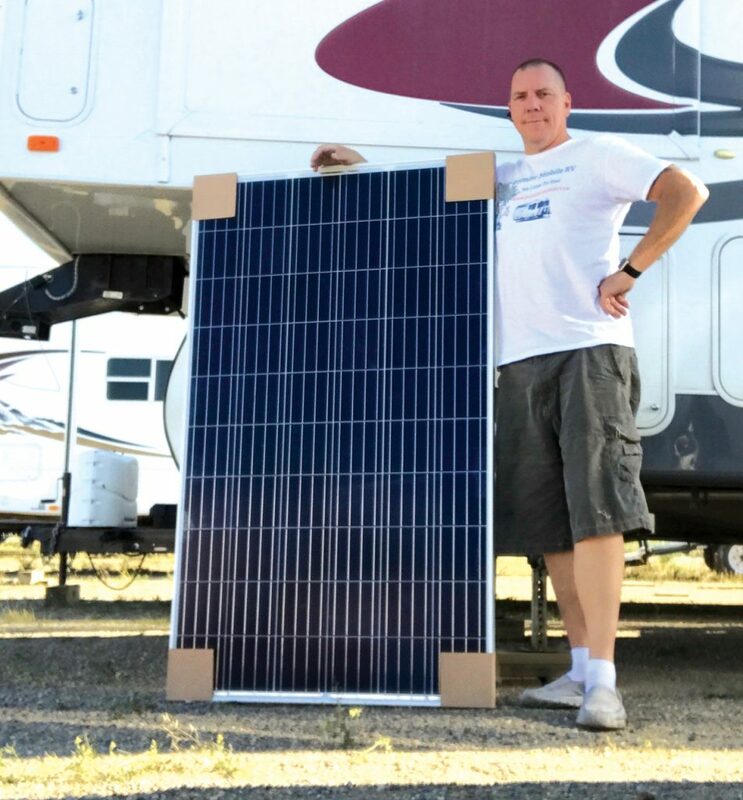 More and more RV’ers are considering adding solar power to their rigs for the convenience of having power to camp outside of any power grid. One common question is “what can my solar panel run?” Well, the simple answer is nothing! Solar panels have only one purpose – to charge your batteries that run your 12-volt system. Think of your batteries as a fuel tank, and the sun is your fuel. The solar panel is like a funnel to capture the most sunlight possible to refill your tanks (batteries). Solar panels are sold in “watts” and through a regulator produce “amps” to charge your batteries. The more watts you have, the faster your batteries will charge during sunlight. For example, a 150-watt panel will produce about 8.2 amps at peak sunlight, when the sun first comes up the amps will read from around +/- 1 amp to its peak amps, then back down to +/- 1 amp as the sun goes down. From personal experience, your batteries will be back to capacity by noon the next day. By adding a couple of six-volt batteries, a 2300-watt inverter, and a 150-watt solar panel to your RV, most people can camp indefinitely off-grid with very little maintenance. Maintenance can consist of keeping your solar panels clean and your batteries fully charged all year round (and topping them off with distilled water as needed). You can always add more batteries to store more power and add additional solar panels to charge them up faster if you find you are using more power in your system. I hope you found this information helpful to make your RV adventures the best they can be!